Aerospace Composites Market Growth « Global Market Insights, Inc.
Powered by the improving economic stability and heavy government investments in improving the aircraft infrastructure, global aerospace composites market has witnessed a rather commendable growth over the recent years. The perpetually rising demand for commercial & military aircrafts has massively propelled the use of composites in the aircrafts, both in the interior as well as the exterior applications. Moreover, the growing preferences toward cost effective, lightweight, and sturdy components with exceptional processing efficiency have further enhanced the scalability of composites in aerospace applications – a trend that is phenomenally driving the commercialization matrix of aerospace composites industry. As per a report by Global Market Insights, Inc., in 2016, aerospace composites market size was estimated to be worth USD 2.5 billion and is further projected to cross a valuation of USD 5 billion by 2024. Aerospace composites market share is slated to extensively proliferate in the commercial sector, given the extensive use of carbon fibers in these aircrafts. As per estimates, aerospace composites market share from commercial aircrafts generated revenue over USD 1.4 billion in 2016, and is further projected to dominate the industry landscape, holding 52% of the overall share in the coming seven years. The increasing demand for commercial aircrafts due to rise in passenger traffic travelling by air, especially across the Asia Pacific belt have carved a lucrative roadmap for the regional aerospace composite industry. 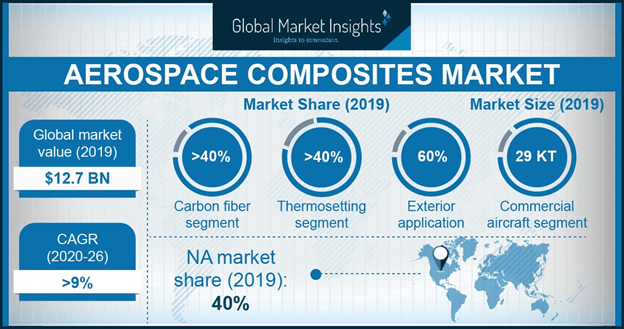 In addition, the robust urbanization & industrialization trends across the continent, along with increase in income levels of mass population have further led to considerable upsurge in the APAC aerospace composites market demand. Besides commercial projects, the regional government & private entities are also witnessed making huge investments in the defense and civil aerospace sector for upgradation. Backing with an instance, the military aviation sector of India is likely to capitalize USD 35 billion in the timespan of next twenty years, to refurbish the aircrafts with technical requirements, quality control, and safety features. This is set to generate huge demand for aerospace composites for renovating or manufacturing interior & exteriors of aircrafts. With India, China, and Japan at the forefront, Asia Pacific aerospace composites industry is expected to register an annual growth rate of 8.5% over 2017-2024. Speaking of prominent players, Scaled Composites, one of the renowned names in aerospace composites market, is currently developing Stratolaunch – the world’s largest aircraft by wingspan. As per sources, the entire aircraft structure is developed with carbon composites components, to enable the aircraft to be of high strength, yet lightweight. In 2016, the company also launched its all-carbon composite rocket plane know as SpaceShipTwo or VSS Unity. Recently, the company was also in news for having unveiled & flown its first of two new experimental aircrafts called Model 401. Allegedly, with reference to this project, the company demonstrated advanced and low-cost manufacturing techniques to other industry partners as well the US government. Speaking along similar lines, such innovations and advancements in aerospace materials are anticipated to be the chief parameters underlining the strategic landscape of aerospace composites market in the coming years. In terms of volume, industry experts claim global aerospace composites industry size to exceed 70.5 kilo tons by 2024. This entry was posted in Automotive & Transportation and tagged Aerospace Composites Market, Aerospace Composites Market Analysis, Aerospace Composites Market Forecast, Aerospace Composites Market Growth, Aerospace Composites Market Outlook, Aerospace Composites Market PDF, Aerospace Composites Market Report, Aerospace Composites Market Share, Aerospace Composites Market Size, Aerospace Composites Market Update, Asia Pacific Aerospace Composites Market, Europe Aerospace Composites Market, North America Aerospace Composites Market.